Professional with high quality prints and fast output, the Lexmark CX727de is a reliable solution for the needs of medium to large businesses. Packed with a powerful processor, exceptional colour matching technology and flexible paper handling options, the machine can handle most printing, scanning, copying and faxing projects in both colour and black and white. The device offers a great array of technological options for printing and scanning, with easy-to-use mobile printing and advanced scanning systems from auto de-skew, integrated file compression and scan to email functions. The all-round Lexmark CX727de also features high-resolution printing, decent paper tray storage and automatic document feeder for scanning. The cube-styled machine can easily be placed on most tables or desks, or could be a standalone device using an optional adjustable printer stand. The Lexmark CX-727de measures 648 x 505.5 x 533 mm and weighs just shy of 45kg. It features an attractive seven-inch colour touchscreen that controls most of the machine’s operations. The device includes an input capacity of 650 sheets as standard, with the option to add more trays, bringing the capacity to a maximum of 2,300 sheets. The fast-paced machine offers printing speeds of up to 47 pages per minute, with a time to first page speed of approximately five seconds. This power is thanks to the 1.2 GHz quad-core processor, up to 4GB of memory (2GB comes standard) and optional hard disk drive. 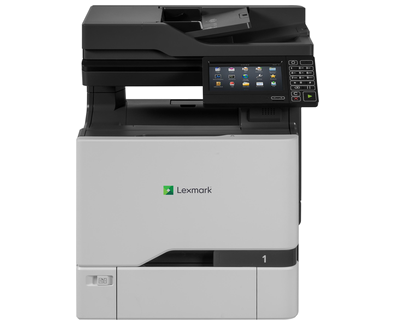 The Lexmark CX727de is a great multipurpose machine that produces professional results in both colour and black and white. The amazing image resolution of up to 1200 x 1200 dpi, 4,800 Colour Quality and PANTONE colour calibration make it a great choice for rich and precise printing and scanning. With a recommended monthly paper cycle of between 2,000 and 20,000, the Lexmark CX727de is definitely not a machine for the average small to medium business. The lack of a stand and wheeled base as standard may make the machine difficult to store, operate and relocate.